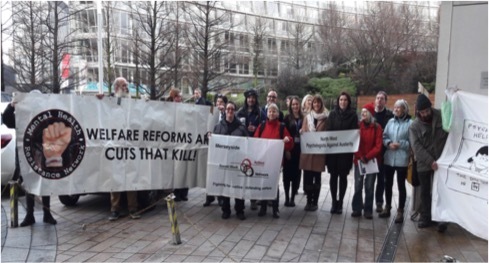 The challenge to the government’s draconian welfare reforms are gathering momentum, and as part of this campaigners from across Merseyside and even as far afield as London gathered outside the annual BPS Clinical Psychology Conference at the Hilton Hotel, Liverpool on Wednesday 18th January. The British Psychological Society (BPS) is the professional body for UK psychologists and has been working with the government on aspects of its welfare reform programme. Service users/survivors, mental health workers and clinicians from a range of groups including Psychologists Against Austerity (PAA), Mental Health Resistance Network, Disabled People Against Cuts, Social Work Action Network (SWAN) as well as trade unionists arrived bright and early at the venue to share our concerns with conference attendees. There is strong evidence of the detrimental impact of welfare reform on claimants with mental health needs so we are calling on the BPS to withdraw from all work with the Department of Work & Pensions (DWP) and join us in demanding the government end their harmful welfare reform programme. As a result of our lobby, delegates informed us that welfare reform had become a major discussion point for attendees inside. 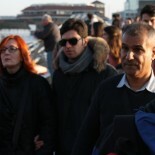 Then as a result of this pressure a call came through to inform us that Peter Kinderman, president of the BPS, had invited us to address the conference the following day to explain our position and present our demands. 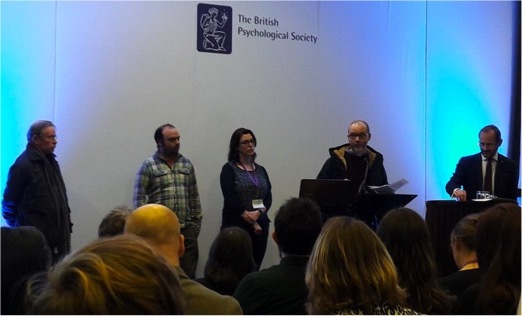 The next morning a group of campaigners representing the breadth of our alliance –service-users/survivors, a carer, and activists from North West Psychologists Against Austerity, Mental Health Resistance Network and SWAN – spoke to 300 psychologists at the first session of the conference. The group shared a strong message about the effects of welfare reform and called on the BPS to withdraw from all collaboration with the Department of Work & Pensions. In his response BPS president Peter Kinderman accepted some of our arguments but maintained that the BPS needs to continue to work with the DWP to get its perspectives heard. We reject this argument. We believe continued BPS involvement only lends credibility to the government, and BPS withdrawal would send a strong message about clinicians’ and service users’ concerns. We will continue to call for an end to all collaboration between the BPS and DWP. The DWP is an unethical body that is damaging the lives of claimants with mental health needs. However we believe that this action and the growing campaigns around the country are starting to make a difference on this issue. A number of clinical psychologists attending the conference told us that the lobby and ensuing discussions would help to strengthen their voices within the BPS to make the case against the organisation’s involvement with the DWP. We believe that when service users/survivors, psychologists and other mental health workers come together we are stronger. We will keep building alliances to pressure the BPS to withdraw from involvement with the DWP and to bring an end to the government’s wider programme of welfare cuts, reforms and psychocompulsion. If you would like to get involved please email us on mhwelfarereform2016@gmail.com. This entry was posted on February 3, 2017 by paulwilliamatkinson in Activism, Benefit Sanctions, Jobcentres, Mental Health Campaigning, Welfare Benefits.